Are you a working women or a busy professional (or anyone for that matter) looking for instant yet healthy recipes, then this is just for you.This is a very easy and healthy dosa prepared with just 2 main ingredients- rice flour and wheat flour (no maida). If you learn to make this dosa, it will save you a lot of time, it will come handy when you return home late from the office and make your time in the kitchen quite pleasant.Though I have posted wheat dosa earlier here, this is a more detailed recipe with step wise pictures for beginners. I have also given another recipe for wheat dosa which is also equally good. In a bowl, mix together wheat flour, rice flour, green chillies, ginger, cumin seeds, curry leaves and salt. Add water little at a time and mix well so that there are no lumps. Heat a tsp of oil, add mustards seeds, when it splutters, add hing and pour it into the dosa batter and mix well. Now our wheat dosa batter is ready. See how watery and thin it is in the picture below. Now heat a tawa, once the tawa is heated, reduce the heat to medium, pour a ladle of batter from the outside of the tawa, then fill in bigger gaps if any.You cannot spread this batter like regular dosa but have to pour the dosa batter like rava dosa. There should be small holes in the dosa. Now flip the dosa to the other side.Once the other side is cooked, remove the dosa from the tawa. Before making the next dosa, mix the batter well to avoid sedimentation. You have to mix the batter every time before making every single dosa. If you are a beginner, you might find it difficult the first two times or you may even fail, but once you practice, you can make this dosa with ease. Do not give up. Initially try with less quantity. (1/4 cup rice flour + 1/4 cup wheat flour). Serve with any chutney or sambar. We had it with tomato chutney with garlic. Instant tomato chutney also goes well with this. I have tried my best to make it simpler, if you still have doubts, mail to me or use the comment section of this page. Soak 1/2 cup whole urad dal for 3 hours. Grind it until smooth and fluffy just as you grind for idly. Mix 4 cups wheat flour with little water without any lumps. Then mix the ground dal and needed salt with the above. Add water if needed. The consistency should be that of dosa batter consistency. If you make dosas on the same day, mix a little sour buttermilk. If you ferment the batter and prepare dosa the next day, then you need not add buttermilk. Prepare dosa just as you make regular dosas. These dosas should be served hot. If dosa sticks to the tawa, switch off the flame, drizzle a few drops of oil and rub the tawa with half an onion. You can sprinkle water to bring down the temperature, if the tawa gets too hot. Use only sponge and liquid soap to clean the tawa. Wipe it dry and store it. sometimes i make this for my urgent rava dosai adding little rava ! look good ! Dosa looks delicious and crispy. Just yummy and so tempting. I never get mine so crispy. We make a similar crepe in Maharashtrian cuisine called 'ghavan'. I like the addition of rice flour, makes is crispy. Yumm! My favourite dosa.. And very easy to make.. Superb. Dosa looks so crispy and healthy.. Liked the wheat version very much..
Looks awesome Padhu. My grandmother used to make this for us. Love that super lacey and crispy wheat dosa, love this instant dosas anytime. Super crispy and delicious dosa !! Dosa looks nice and crisp. Using wheat is a good option. I never could make such crispy lacy dosas.. gorgeous!! I was looking for a dosa recipe with wheat flour. I am going to make it today. Thanks for the detailed recipe. It looks amazing and it's also super easy! Thank you! I tried this recipe today and it turned out very nice. Thanks for sharing quick and easy recipe. Thanks for this recipe. It is very tasty and was an instant hit at home. 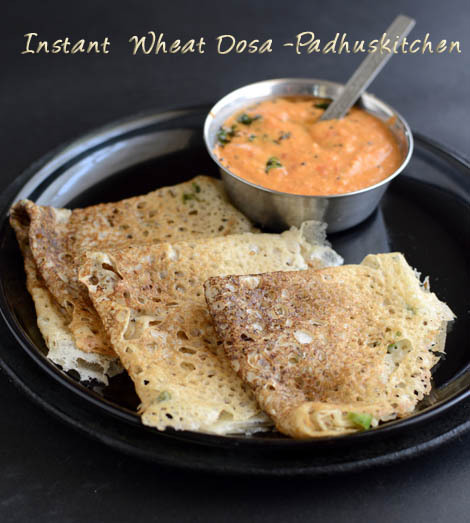 Thanks Padhu for this beautifully explained yummy wheat dosa recipe. This is my dinner tonight and am sure my kids will enjoy this crispily delicious dosai. Thanks again and keep them coming! I enhanced this dosa today a little more, adding carrot and onion toppings and it was as colorful and wonderful......Very nice breakfast recipe !!! I used to prepare wheat dosa daily with raghi, and others. but this is a new idea for me to add rice flour also. Am fond of eating rava dosa with coconut chutney. this is an useful tip for me. Wanted to know how many days can i store it in the fridge..???? Shweta -You cannot store the batter. You have to use it on the same day. You can half the recipe and prepare dosa. If you store it in the fridge, the next day it is a bit difficult to prepare this dosa. RESPECTED PADHU MADAM: I AM A 61 YEAR OLD MAN, UNDERSTANDABLY LOOKING FOR SIMPLE AND TASTY RECIPES.I BUMPED INTO YOUR BLOG POST AND WAS IMMEDIATELY ATTRACTED TO THIS DOSA. I MADE IT IMMEDIATELY AND IT WAS AS I HAD WANTED A DOSA TO BE. MY 20 YEAR OLD NEIGHBOUR ARRIVED WHILE I JUST PREPARED IT AND SHE LIKED IT VERY MUCH AND SHE REPLICATED IT . MY 86 YEAR OLD UNCLE AND AUNT ARRIVED FROM NEW DELHI TOGETHER WITH RELATIVES FROM MUMBAI AND ALL OF THEM LOVED IT.I HAVE BEEN MAKING THIS DOSA FOR THE PAST ONE MONTH AND I JUST THOUGHT THAT IT IS TIME FOR ME TO THANK YOU SINCERELY FROM THE NORTH WEST CORNER OF MY HEART FOR YOUR WHEAT DOSA WITH RICE FLOUR RECIPE.PLEASE KEEP THIS OLD MAN IN YOUR MIND WHILE YOU TRY EXPERIMENTING AND INVENTING NEW SHORT CUT RECIPES. THANK YOU AND GOD BLESS YOU. YOU MAY IF YOU WISH, INCLUDE MY NAME IN YOUR MAILING LIST. The dosa tears when I try to flip it over and also it isn't as 'lacy' as yours. Shreya - The batter should be a little watery to get lacy dosas. This dosa will take a longer time to get cooked, so do not hurry to flip it over. Give enough time and then flip it over. Simple n healthy receive. Thanks for sharing. I tried this recipe and it came out crispy and nice. I tried the same thing with ragi and it came out so very well too.. only difference is i added one table spoon of maida to one cup ragi flour and one cup rice flour.. it comes out very crispy..
Hi Padhu. Tried this recipe today. It was superb. My 5 year old daughter also liked it. We had it with coconut chutney. Thanks for sharing. Perfect when you want that extra crunch for breakfast! Can I store the remaining batter to be used for the next day or should I use them all on the same day of preparing the batter? Heyyy..made this for my 18 months dd with less chilli and roasted in ghee..it went munch munch munch...thanks will be trying much more of your recipes ! Thans to you maan, I have had a delicious dinner today. Hi mam, like your recipes with clear pictures and notes. I tried this simple easy dosa recipe and turned out well. Saves lot of time . thank you for this. I would earlier do wheat dosa with leftover dosa batter and not make it watery hence would get thick dosas, but now I can get thin crispy dosas with your help. Thank you . This dosa remains my mom. I felt tears while making this recipe. I am in US .she is in India...missing home food much. :(thanks padhu your recipe is awesome. Tried and came out superb, thanks. Tried yesterday. Crispy and tasty.. Tried the rice and wheat flour dosa recipe for breakfast this morning. Love the appearance, texture and flavor! Excellent for a quick Indian breakfast for sure. For 1/4 cup wheat and rice flour, how much water is required? and how much will it yield? I just want to make some 5-6 dosas only. Will 1/4 cup enough for that? This is one of my favourite and easy dinner receipt. Thanks for sharing this receipe. Padhu, you are so detailed in your instructions and you add a personal touch by providing your own experience. Your passion for cooking and your desire to help others enjoy the experience is commendable. A wonderful blog !! Thank you so much !! The batter could have thickened. You should have diluted it with a little water and made dosas. It is best to use the batter on the same day or within 2 days. Wow tasty Dosas!! ... thanks for the recipe... its my first time and the dosas came out very well.